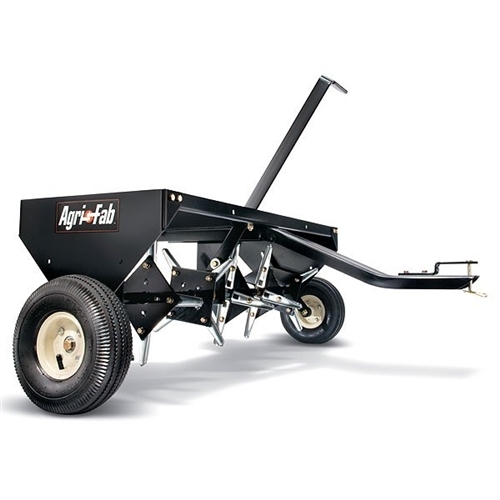 The Agri-Fab 45-0299 aerator is a towed plug type with a 48" working width. The aerator removes soil plugs from the lawn which helps loosen up the compacted soil, which then promotes healthy growth. Especially effective when used on clay type soil or heavy traffic areas and burned out lawns due to drought. The 45-0299 has 8 sets of heat treated knives which are galvanised so are rustproof and are designed for a long working life, a working width of 48" and has an aeration depth of 3 inches. Comes complete with large 10" pneumatic tyres. The main frame is made of heavy duty steel and an easy to use cantilever transport handle which can be operated from the tractor seat which makes for easy raising and lowering of the aerator, when being transported between lawn areas.